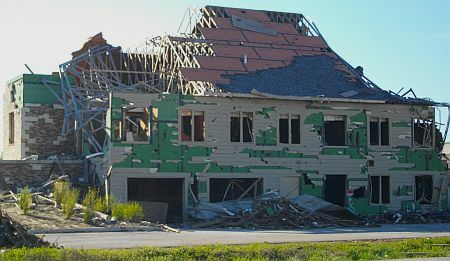 We went to Joplin, Missouri for Sunday Brunch and were shown the damage from the tornado of May 22, 2011. A whole section of the city was literally wiped out, including a 600 bed hospital. Most of the debris has been cleared away, but some structures were still standing, showing the destruction that occurred. It was amazing to see the line of delineation, trees intact on one side, stumps or gnarled, branchless trunks with scraps of debris wrapped around them on the other! This entry was posted on Friday, March 30th, 2012 at 7:42 am	and is filed under Uncategorized. You can follow any responses to this entry through the RSS 2.0 feed. Responses are currently closed, but you can trackback from your own site.